Bob is pictured with his family after being sworn in as the Illinois State Representative for the 58th District. 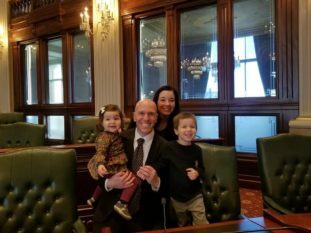 Bob Morgan (’05) was sworn in on January 9, 2019 after being elected as the Illinois State Representative for the 58th District. The District, along Chicagoland’s North Shore, includes all or parts of the Bannockburn, Deerfield, Glencoe, Highwood, Highland Park, Lake Bluff Lake Forest, Lincolnshire, Northbrook and North Chicago.